I don’t know if you’ve noticed this or not, but you’re busy. With open houses, private showings, meetings with clients, meetings with other agents, drafting documents, writing up agreements, e-mails, making phone calls, your list goes on and on. On top of all that, you need to maintain your web presence – updating your blog, posting to your social media accounts, and creating new content for your site. Where does it end? Well, it doesn’t. Successful people are busy. It’s a fact of life. Working yourself to the bone is known to cause burnout, and that doesn’t make you money. However, slowing things down won’t make you any money, either. The key is to get organized and simplify your life so you can make the most of the hours you work. 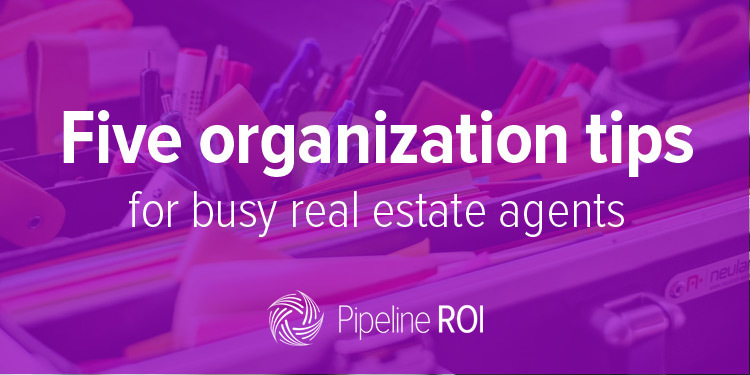 Here are five organization tips for busy real estate agents. If you have a ton of things to do, you’re going to have to know what those things are and when they are due. Google Calendar is here to save the day! Compatible with both iOS and Android, this app has the ability to be synced across any device with an Internet connection and is sharable with all other Google Calendar users. What does this mean for you? Not only can you access your calendar from virtually anywhere, you can also make sure anyone else that needs to know your schedule can have it, too. Whether it’s a co-worker, your spouse, or your broker, being on the same page about where you are (and when) has never been so easy. Best part – it’s free to use! Want to learn a little bit more? Check out Wired Impact’s “8 Reasons Why You Should Use Google Calendar.”Already sold? Click here for iOS or here for Android. After a long day of paperwork, showings, and e-mails, posting on your Facebook or Twitter accounts is probably the last thing on your mind. Rack up a few days like this in a row and it can turn into weeks or months between posts before you know it. So get ahead of the curve. Pipeline ROI’s social media scheduler is a great way to make the most of your time and your accounts. Buffer and Hootsuite’s social schedulers are other popular options for you to take charge of your social media and keep it updated with fresh content while still having time to do something else. Set aside one or two hours out of your week to sit down, write up some posts (or choose from Pipeline ROI’s suggested content), and schedule them to go out. By condensing the time you spend on this one activity, you’ll have the option to spend it on other projects, whether work or leisure. Social media is just too important in today’s market to let it fall by the wayside. Check out this post to learn why. In an ideal world, you would have the time (and energy) to personally e-mail each and every one of your contacts, leads, and clients. However, as we all know, that’s just about impossible. Of course, there are people that may call for this type of personal attention, but what are you supposed to do with the rest of your database? That’s where drip e-mail comes in. By setting up targeted campaigns for your contact groups, you can set your e-mail marketing on auto-pilot so they’ll get the information they need without you having to remember to contact them each week. Since you don’t physically have to type up every e-mail in the campaigns and send them individually, it’s a huge time saver! You could be out showing a home or even taking a much deserved break while the Internet does some work for you. So how do you start a drip campaign? There are a few different options. Many CRMs come with automated versions with different messages for different types of contacts, like ours, which is specific to real estate with lots of campaigns for buyers, sellers, FSBOs, and much more. Mailchimp is another option, allowing you to simply drag and drop to craft your perfect e-mail. Of course, you’ll need to come up with the content. Not exactly original advice, but there are now pretty original ways to do it – enter Trello, Evernote, Producteev, and Wunderlist (among others). Trello is a simple project management software that gives you the ability to create “cards” for tasks and boards for organizing the things you have to do. Effectively, it puts you in control. Watch this video to learn more abouthow you can use Trello as a real estate organization tool. Evernote allows you to keep all your notes in one place. Got an hour? This video shows you 50 ways to use Evernote in your real estate business. Needless to say, it’s useful. Producteev and Wunderlist are two more project/task management solutions that allow for teams, reminders, and much more. Here’s a video about using Wunderlist specifically for real estate pros. A cluttered inbox equals a cluttered mind. We’ve all been there – hundreds of e-mails and no idea when you last went through them. Did I respond to all the ones I needed to or did I just read them? Was there anything I was asked to do that I never got around to? Labeling and de-cluttering everything that comes into your inbox will make a huge difference in making your life as a real estate agent a more organized one. Take action with each and every e-mail you get. Whether it’s to delete, file away, or respond immediately, don’t just let it sit there until you come across it again months down the road. Curious as to what specific steps you can take to be efficient and organized with your e-mail? Forbes has created a short list of ways you can gain control over your inbox.